Here in Washington early deer, bear and late turkey seasons all fallin late September. On opening day of late turkey season I was hunting an old apple orchard using a ground blind. My thoughts were on whitetail. In the morning I was lucky enough to arrow a Merriams hen. Returning to the blind for the afternoon hunt I was a bit suprised when this fellow showed up. A nice 8 yard shot with my 47# Kota longbow, both lungs. That's a nice looking deer you got there (nice looking bow too). 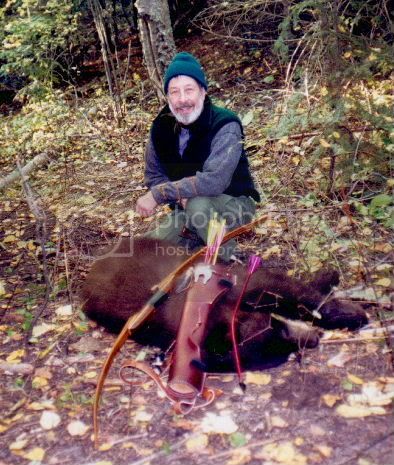 Would have liked to have shot this bear with one of my bows but did not work out that way, maybe next time.